Last week, a friend of ours told us his mother was selling the family château in Brittany. Thomas’ dream of becoming a gentleman farmer as they say in French – also the name of a brand of clothing here – was shattered. But will he really miss paying 20,000€ in property taxes every year? And just as much in upkeep and maintenance? The main Commons house, with its large functional kitchen, armoires full of mismatched dishes, and old-fashioned Moulinex toaster (what’s that burning smell? ), is comfortable. But the grande maison is majestic: built by a couple of métayers, or tenant farmers, the manor’s central feature is a tower with a large clock, whose bell would signal to field hands when the working day was over. Nowadays, the old clock has stopped, but the manually-operated dinner bell still gets plenty of use: family members ring it by pulling on the long chain at around 7 p.m. to signal aperitif hour. Children of all ages stop whatever they’re doing – gathering wildflowers, riding broken-down bikes, lolling next to the (inflatable) swimming pool – and come running for cool beverages like kir (blackcurrant liqueur + white wine) or limonade and dried sausage. All over Europe, the terms grande maison, Great House, or Big House are used to refer to one’s estate or villa, noblesse oblige – meaning that your very position as a château owner, or châtelain, means that you would never actually use the word château. The words château or mansion apparently are discouraged even by modern etiquette books, discounted as decidedly déclassé and pretentious ways of referring to one’s estate. If only the authors of those books knew that the “Big House” in the United States means prison! So I did, and then I walked alongside my bike some ways down a dusty gravel lane. Parking my now-dwarfed bicycle in the shade of a massive L-shaped château, I marveled at the pair of wide turrets which buttressed the château’s eastern end. Once past my stupefaction at this even bigger version of the Big House, my host gave me a complete tour: portions of the château dated from the 16th century, and the most modern part had a keystone inscribed with the date 1881. Feeling a little overwhelmed, I made my way past framed family trees dating back to the Middle Ages, and climbed stairs under the scowling ancestors whose portraits hung on every dark wood wall. But the dim interiors were a pleasant foil to the stifling heat and sun in which I’d just spent hours pedaling my bicycle. A recent inheritance, the château hadn’t been continually maintained throughout the years, and so my friend and her husband were confronted with the daunting task of sorting, organizing, and redistributing the stockpiles of royal furniture (mostly Louis XV) as well as the damp, crumbling papers and books that filled room after room after room, each one more cobweb laden than the last. Finally, when we arrived at the library, whose walls were crumbling, and I saw the number of books that had been ravaged by hungry rodents, I couldn’t help feeling a little sorry for my friends. Sure, I can just hear you thinking, "Poor little château owners!" But they didn’t ask to inherit a château, and considering the cost of renovation and upkeep of this place, it occurred to me that the American way of using the term “Big House” wasn’t so inappropriate after all. This is a particularly peasanty yet pleasant dish. The term pâté is used freely here: it is not the terrine-like cooked mixture of finely ground meat or fish that gives a whole new meaning to the term lèche-vitrine (literally, window-licking) when we see one in French traiteur shops. This pâté is rather a reference to the old-fashioned word pâte, without the second accent, which simply means pastry, and more specifically, puff pastry. 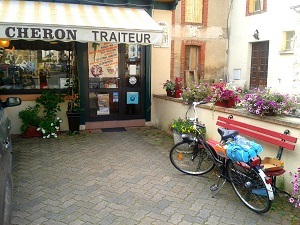 If you visit the Creuse, you’ll find the best pâté de pommes de terre at the butcher-caterer Chéron, in Fursac. Open since 1933, and passed down from one generation to the next, it is often Guillaume’s elderly mother who serves customers in the shop. The charcuterie also sells meat-filled or lardon-laced versions of the same pastry, which are a luxury indeed. But if you happen to be a nouveau pauvre château heir, get just the potatoes, also known as "poor man’s bread." 1. Using a pastry brush, grease a fluted tart pan (11-inch or 26 cm diameter). Press the first sheet of puff pastry well into the bottom and sides of the pan. Reserve in the refrigerator. 2. In a large bowl, combine the crème fraîche, shallots, garlic, and the chives or parsley. Mix well. 3. Add the salt and pepper and taste. The mixture should taste salty, because the crème fraîche mixture will be diluted into the potatoes and their starch during cooking. 4. Using the slicing disc of your food processor or a hand mandolin, slice the potatoes (⅛-inch slicer or 3mm). 5. Preheat oven to 400°F (210°C). 6. Remove the puff pastry base from the refrigerator, and brush the bottom with the egg white. 7. Divide the potatoes into 3 separate bowls. Spread the first ⅓ of potatoes onto the puff pastry, making sure to separate the thin layers as you go to avoid potato clumps, and forming a slight dome in the middle. 8. Spoon half of the crème fraîche mixture onto the potatoes, spreading as you go. 9. Repeat the process, ending with the last layer of potatoes. 10. Add a few drops of water to the egg yolk. Brush the inside edges of the puff pastry with a bit of this egg wash, making sure to save most of the egg wash for the top of the pastry. 11. Lay the second sheet of puff pastry on top of the potatoes, and press the edges into the inside, making sure the edge forms a seal with the bottom layer of pastry. 12. Brush the top of the pastry with the remaining egg wash, and with a knife, make three small holes in the top of the pastry (we call these chimneys in French! ), to let the excess steam escape while the pâté cooks. 13. Place the pâté in the oven, and cook at 400°F (210°C) for ten minutes. Without opening the oven, lower the temperature to 350°F (180°C) and continue cooking for about 45-50 minutes, or until the top of the pâté is a deep golden color. 14. Remove from oven, let cool slightly, and serve with a huge green salad. The pâté can also be eaten just slightly warm, and can be made ahead of time. Bon app’!